Crystal Hills Assembly celebrated its 75-year anniversary as a church with its "Diamond Jubilee" this weekend. Current and former members celebrated the church's history and mission with events on the church grounds on Saturday and Sunday. 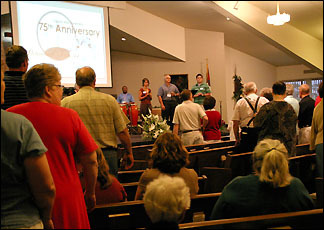 Crystal Hills Assembly celebrated its 75-year anniversary as a church with its "Diamond Jubilee" this weekend. Current and former members celebrated the church's history and mission with events on the church grounds, located four miles southeast of Paynesville, on Saturday and Sunday. Visitors traveled from as far as Tennesee and Texas for the jubilee, which began with a picnic in the fellowship hall on Saturday afternoon at 5 p.m., followed by a worship service at 6:30 p.m.
On Sunday, the jubilee continued with fellowship at 9 a.m.; a worship service at 10:30 a.m.; a potluck dinner at 12:15 p.m.; a homecoming concert at 2 p.m.; and a dessert cafe at 3:30 p.m.
Pastor Lonnie Gleitz, who made an early return from a six-week sabbatical to prepare for the anniversary celebration, said to the congregation gathered in the sanctuary on Saturday evening, "This night and this weekend is a time of celebration." Crystal Hills Assembly celebrated their church's Diamond Jubilee (75-year anniversary) over the weekend with a picnic, worship services (shown on Saturday night), fellowship, potluck, homecoming concert, and dessert. Saturday's worship service also featured guest speaker Denny Curran, who pastored Crystal Hills from 1985-92. "The atmosphere in this place," Curran said, "Can you feel it? It's just incredible." Curran recollected days spent with pastor Wes Vagley, who was at Crystal Hills Assembly from 1976-85. He recalled funny moments with past members and encouraged present-day worshipers to continue supporting Crystal Hills Assembly. "The atmosphere is right in this church for a great revival," he said. Curran also gave thanks to the founders of the church, "a group of young men that got hungry for Jesus," adding that a church is not about the building. What needs to be paid attention are the empty pews, he said. A brief slideshow of photos set to music allowed worshipers to sigh, laugh, and weep with recollections of moments from the church's past. Following the photos, famous lyrics shone from the screen: "They will know we are Christians by our love." The church - with 66 charter members - was founded in 1931, using the name Paynesville Gospel Tabernacle, and held its first services at city hall. Soon, a church was built on the corner of Maple Street and Minnesota Street. The church was then renamed the Paynesville Assembly of God. 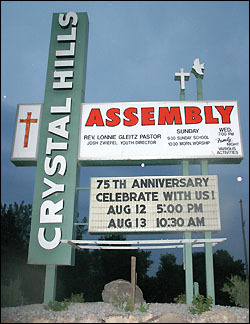 Crystal Hills Assembly was founded in Paynesville in 1931, and the congregation bought an old ski resort and chalet in 1977, moving the congregation four miles southeast of town and changing its name to Crystal Hills Assembly. In 1977, the church purchased the Crystal Hills Chalet (along with 110 acres of land along the Crow River near the inlet to Lake Koronis). The congregation remodeled the ski chalet and supper club into a church and renamed itself Crystal Hills Assembly. The church helds its 45th anniversary celebration in conjunction with the dedication of its new church. Now, 30 years later, the congregation has marked 75 years of service in the Paynesville area. Pastor Lonnie Gleitz took a nearly six-week sabbatical this year, not six months as stated in last week's article about Crystal Hills Assembly.